select the server name in the Connections panel on the left. In the Features view shown in the middle panel, select Logging. For the log file, change the directory to a more suitable drive and folder. For example, I’ve changed the path for the log files to D:\Logs\IIS. How about backing up them Monthly and deleting old logs? 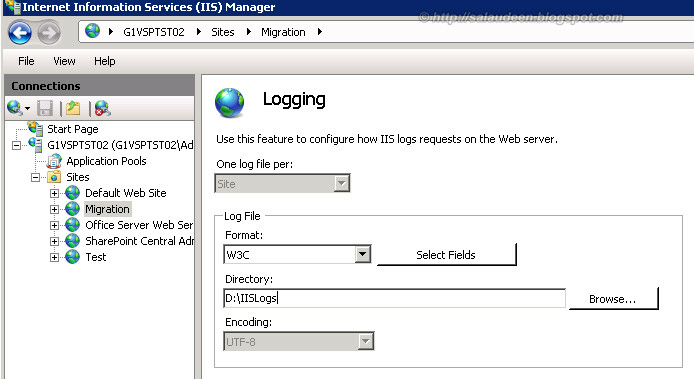 Its a good idea to backup and clean IIS Logs every Month. These Logs are highly compressible up to 500%!!! (Meaning 500 MB file to 5MB file). Finally, We need to schedule the script in Windows Task scheduler. Go to Start > All Programs > Administrative tools > Task Scheduler, and create the task to run the script at d:\Scripts\IISCleanup.ps1. powershell.exe D:\scripts\IISLogsClear.ps1 If you get exceptions like "File not found.." then add the paths D:\Scripts, PowerShell's path in System Environment variable.